Question: We saw a strange blob of light in the sky last night (3/12/15) from Sherwin Meadows near Mammoth Lakes. Our intention was to try spotting Comet Lovejoy using our 10×42 binoculars. Then, around 9:15 pm PDT, just west of Jupiter, we saw this thing appear. It was only a small smudge at first, about the size of the Orion Nebula. But it slowly expanded, dimming as it grew, to a size considerably larger than the Full Moon. Its color was whitish-grayish. As we watched it move past Jupiter from west to east, we noted that it didn’t move nearly as fast as the ISS. And through the binoculars, we could see a tiny pinpoint of light near its center, almost like how a satellite appears. Answer: Yes, there are two possible explanations for what you saw. Your detailed visual description helped me eliminate several other possibilities. You and your husband are obviously experienced observers, and that makes my task easier. excess fuel dumped during the separation of a multi-stage rocket. 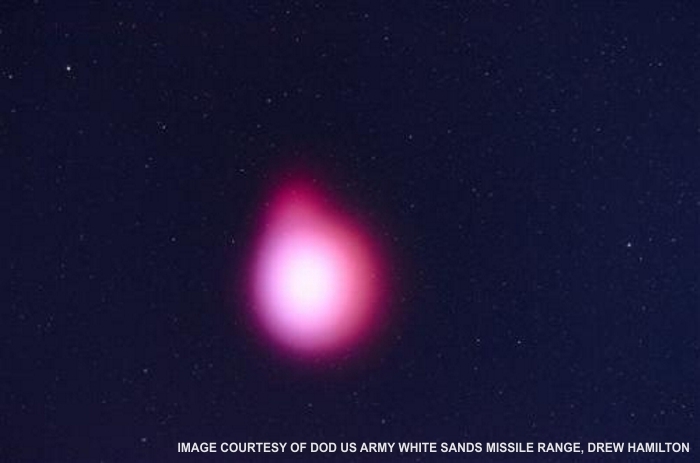 Guess 1: What you saw was the result of a launch from White Sands Missile Range (WSMR) in New Mexico. Rockets are often used to test electromagnetic properties of the upper atmosphere by releasing a cloud of ionized gas. It’s important to understand these properties, since natural ionization at high altitudes can cause delays in GPS signals. Those delays can generate GPS location errors anywhere from a few meters to 40-50 meters. The image above shows a cloud of gas released from a NASA Terrier-Black Brant research rocket. The gas was expelled into the near-vacuum of space just minutes after it launched. That happened on Wednesday, Feb. 25, 2015, so the date doesn’t match. Still, it’s a good example of how these tests appear. The color doesn’t match either, but the color depends on the types of gases released. In this test, the gases were trimethyl aluminum and lithium vapor. So I checked my digital planetarium software. It verified that, at 9:15 PDT on March 12, as seen from Mammoth Lakes, Jupiter was near azimuth 132° (southeast) and elevation 62° (about 2/3 of the way from horizon to zenith). Then I checked Google Earth. It told me from Mammoth Lakes, the azimuth to WSMR is 110° — close enough to 132°. Rockets are rarely fired vertically straight upward — there’s almost always some lateral motion. The 1250 km (777 miles) distance between Mammoth Lakes and WSMR didn’t bother me either, since I’ve seen and recorded launches from Vandenberg AFB in California, 800 km west of my location. I’ve also seen two launches from WSMR, 550 km to the east. Foremost is the altitude reached by the rocket. Most test rockets bound for the upper atmosphere will top out around 100-200 km. By comparison, the ISS orbits at around 400 km altitude. It also depends on the rocket’s trajectory, which is usually toward the east to take advantage of Earth’s eastward rotation speed — 1673 km/hr (1087 mph) at the equator, 0 km/hr at the poles, and 1207 km/hr at WSMR. Another factor is the amount of light pollution at the observing site. These gas clouds aren’t that bright. Spotting one from a bright urban location could be difficult. From the dark skies of Mammoth Lakes, it would be easy. Finally, it depends on how close to sunset or sunrise the launch occurs. Even though it’s “night” at your location, there could be sunlight higher up to illuminate released gases. And that was indeed the case at Mammoth Lakes on March 12 at 9:15 pm PDT, just a couple hours after sunset. I should note that Cape Canaveral is at azimuth 95° from Mammoth Lakes, close enough to be a contender. However, the distance is 3700 km (2400 miles). That would put a 100 km altitude launch well below the Mammoth Lakes horizon. That’s why my first guess was a WSMR launch. As you’ll see next week, I was wrong. Guess 2 was the correct answer. I’ve often said that whatever you see in the sky, there’s always an explanation for it — or at least a reasonably viable scientific hypothesis. We’ve already done some science in this post, and we’ll need to do some more before we have the answer to your question. But nobody likes cliff-hangers, so I’ll provide the answer now. What you saw was the result of a two-stage rocket launch from Cape Canaveral. You can see the launch announcement here. I’ll explain next week how I determined this, but it will require a little more science. Yeah, so am I. 🙂 Still a work in progress, but it’ll be done by next Monday. Turned out there were a few aspects of this “strange cloud” that needed further research. Wasn’t nearly as easy as I expected. Next week’s Sky Lights will contain more graphics than any previous post, but they were needed to convince me (and hopefully my readers) that I really had the answer. Stay tuned!